On this day we celebrate our patronal feast1, the feast of the Apostle Paul, the “chosen vessel” of the Lord, sent to the Gentiles. 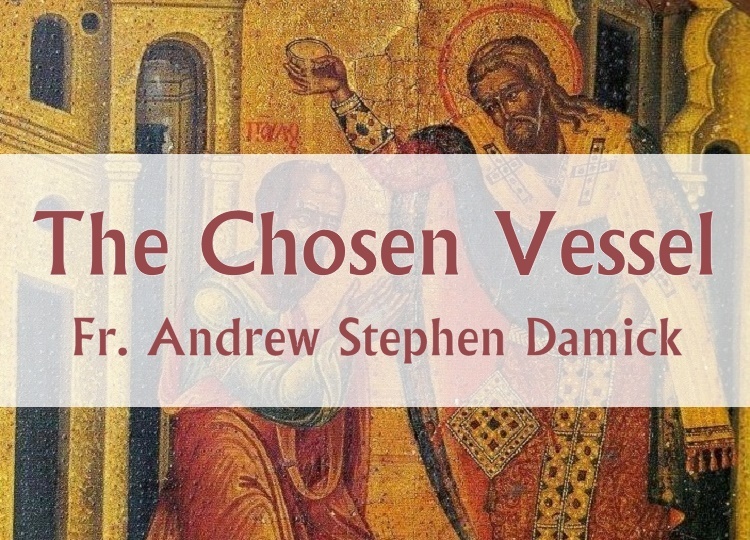 That phrase, “chosen vessel,” comes from Acts 9:15, where the Lord is speaking to a man named Ananias, who is traditionally held to have been the bishop of Damascus at the time of Paul’s conversion to Christ. When God speaks to Ananias, Paul has already had his experience on the road to Damascus, when he is knocked off his horse by a vision of Jesus Christ, and Jesus tells him from heaven that when Paul (who was then called Saul) had been killing Christians and persecuting them, he was therefore persecuting Christ Himself. And the Lord struck Paul blind and then sent him to Damascus to find Ananias. All this is told in the ninth chapter of the Acts of the Apostles. When the Lord tells Ananias that he would receive this Saul and place his hands on him, Ananias says this to God: “Lord, I have heard from many about this man, how much harm he has done to Your saints in Jerusalem. And here he has authority from the chief priests to bind all who call on Your name” (9:13-14). Ananias is afraid. Saul has been killing Christians, and that’s why he had come to Damascus. But God says to Ananias, “Go, for he is a chosen vessel of Mine to bear My name before Gentiles, kings, and the children of Israel. For I will show him how many things he must suffer for My name’s sake” (9:15-16). And Ananias goes to him and lays his hands on him, where he finds that Saul has been praying and fasting. Saul receives his sight again, and Ananias baptizes him as a Christian. And Saul is filled with the Holy Spirit, and he begins to preach in the synagogues of Damascus that Jesus was the Christ, the Messiah whom he had been expecting all along as a Pharisee. And the people were amazed, because they thought that this Saul had come to Damascus to kill the followers of Jesus. But some plotted to kill him, and so Saul escaped from the city at night by being lowered over the wall in a basket. And in our epistle reading for today, he makes reference to this escape. Because the Apostle Paul, as he came to be known after, is our patron saint, I would like to discuss what his conversion story means for us. I also urge you to go home and read all of Acts 9 after coffee hour today so that you can see in full what happens in this story. Read it for yourself and read it aloud to your children if you have them. First, we see that Paul is a persecutor of Christians. He is a Pharisee, trained as a great teacher of the Law of Moses, and he is filled with a sense of righteous mission. He is killing Christians because they are traitors to the Law. So they must die. But then he encounters the risen Jesus Christ in a vision, and everything changes. Well, not everything. You see, this is not the moment that Paul converts to another religion. Why would I say that? You have to understand what it meant for Paul to be a Pharisee. As a Pharisee, Paul believed in a coming Messiah. He also believed in a coming resurrection of all the dead. What he didn’t know before was that the Messiah had come, that Jesus was that Messiah, and that the resurrection had begun with the rising of Jesus. So Jesus Himself appears to him and essentially reveals to him that all his hopes as a Pharisee were actually being fulfilled. In other words, Jesus let Paul know that events on the Messianic timeline were actually further along than he had realized. So Paul doesn’t change to another religion. He just begins to believe that Jesus was the Messiah and that the resurrection had begun. Paul’s conversion story is actually relatable for all us, even if our journey to Christ actually does mean converting from another religion. How? It is because our encounter with the risen Lord Jesus is always about our hopes for what is highest and best, for the possibility of mankind and of the whole cosmos. Even if we do not know, as Paul did, that the Messiah was coming and that there would be a resurrection, we all still have within us the desire for what is true, what is good, what is beautiful. We have a sense that there must be meaning beyond our everyday existence, that our lives must mean something, that the history of mankind must mean something. We may not think of those things often, but those inner sensibilities still drive us. They still inform everything that we think and do. We want there to be goodness and truth and beauty, in a form that is beyond all the imperfection and corruptibility of this world. And we could not want it if we did not in some sense know it already. Paul was looking for the Messiah. What he hadn’t realized is that the people he was killing had already encountered that Messiah. We then see Paul going to Damascus, completing the journey he had started but not in the way he had intended. Isn’t that our life, as well? Don’t we often find ourselves moving along the journey of life, still aging and developing and growing and learning, yet not really what we had intended when we set out? And then we find that we really are blind along the way. Paul loses his sight when he sees that blinding light on the road to Damascus, but all Christ really did there was confirm in a material sense what had already been happening with Paul immaterially. He was blind to the Messiah who had been right in front of him as the Church. But then God sends him to Ananias and sends Ananias to him, just as He sends us to people for us to be guided and sends guides to us, as well. And Paul is revealed then as the “chosen vessel” who will speak before the Gentiles, before kings and before the children of Israel. There is of course a sense in which Paul is special here. 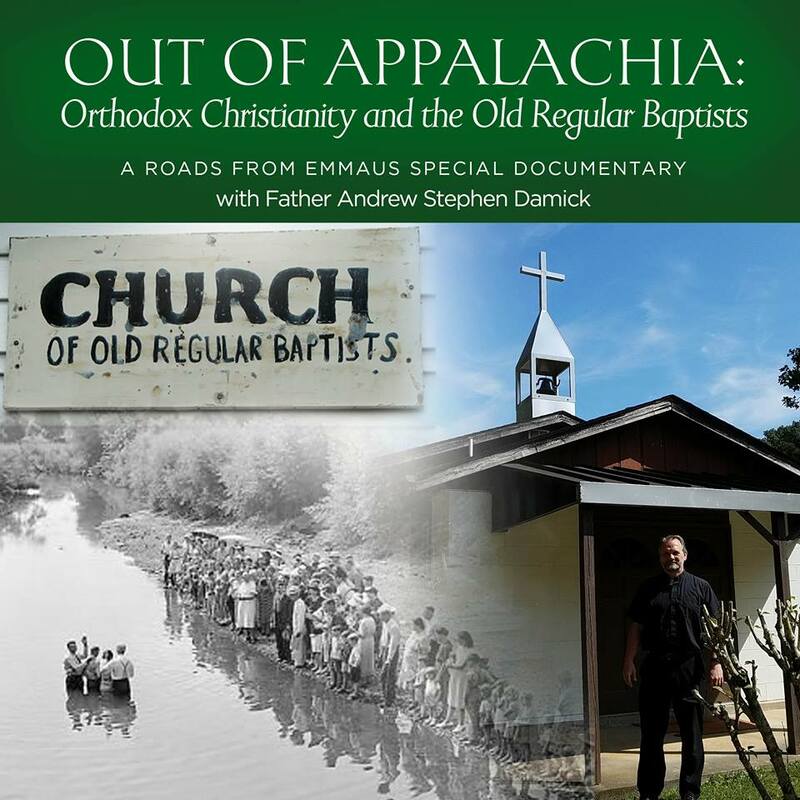 None of us are the “chosen vessel” that he is, in the sense of being apostolic founders of the Church as in the Acts of the Apostles. Yet we are actually called to be chosen vessels, and because our church here is named for this great Apostle, God has called us here at this parish in Emmaus in particular to emulate Paul. So we are also chosen vessels. And who has chosen us? It is God. It is not we ourselves. We don’t take this mission upon ourselves. We don’t give it to each other. I have not chosen you. The bishop has not chosen you. It is God who has chosen you to be vessels of His Gospel. And how can we understand ourselves also to be speaking to the Gentiles, to kings and to the children of Israel? For us, “the Gentiles” are those who do not yet have the hope of the Messiah and the resurrection. They may be non-Christians. They may be those who identify as Christians who have been ill-served by their own churches in not being shown the Messianic hope of the resurrection clearly. What about “kings”? We may not speak to literal kings, but we are also called to be bold before whatever authorities we encounter—not to be merely rebellious, but rather to be witnesses to the love of Jesus Christ for the world for whom He died and rose. And in doing so, we do not have to be afraid of earthly power. And when Paul spoke to the “children of Israel,” as a vessel he bore to them the revelation of Jesus Christ. And the “children of Israel” for us are as they were for Paul—our own people, our own families, our own social circles. We have a responsibility to bear Christ even within our own homes and direct spheres of influence. Paul’s purpose as a chosen vessel was to bear Christ within him to everyone he met. As those under his patronage in this parish, this is our purpose as well. God has chosen you to be His vessel. He is ready to fill you up with His Holy Spirit just as He filled Paul, so that the good news of the Messiah Who has come and of the resurrection that has already begun with Him may be communicated in fresh language to our own generation. Through the prayers of the holy, glorious, all-laudable and foremost among the Apostles Paul, may we always give glory, honor and worship to our Lord Jesus Christ, with His Father and the Holy Spirit, now and ever, and unto ages of ages. Amen. Certain parishes named for St. Paul alone (i.e., not for Ss. Peter and Paul together) celebrate their patronal feast on Oct. 29. In the history of the Church and in various times and places, Paul had his own feast on various dates. Oct. 29 is one of them. Is the Church a Refuge? Is Our Giving Worthy of Our Calling?